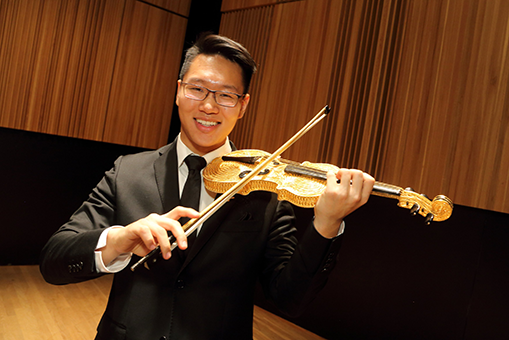 Following an exciting public recital competition held on Sunday October 19th in Tanna Schulich Hall, Jury chair Prof. Douglas McNabney announced Byungchan Lee as winner of the Golden Violin Competition. Each of the three contestants (Byungchan Lee, violin; Andrea Stewart, cello; Elizabeth Skinner, violin) are current students at the school and were chosen by the string faculty based on their demonstrated exceptional talent and contribution to musical and cultural life at the school. The Golden Violin itself, made of pewter and gold plate is on permanent display in Schulich’s Marvin Duchow Music Library and was a gift in 2006 from businessman and philanthropist Seymour Schulich. The eight past winners include Emmanuel Vukovitch, Lambert Chen, Chloé Dominguez, Aaron Schwebel, Ewald Cheung, Isaac Chalk, Baptiste Rodrigues and Victor Fournelle-Blain. The Golden Violin Competition prize includes a recital at Schulich as well as a noon hour recital next season in Toronto at the Richard Bradshaw Amphitheatre of the Four Seasons Centre for the Performing Arts. In addition, the winner receives a cash award of $25,000 along with a 14-karat gold lapel pin in the likeness of the Golden Violin. The five-member jury was comprised of Douglas McNabney, Stéphane Lemelin, Felicia Moye, Elizabeth Dolin and guest Federico Agostini from the Eastman School of Music.